In the days before this area became a National Park I remember seeing cattle grazing here. 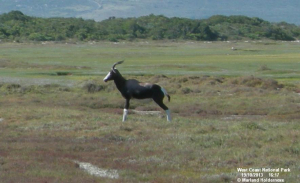 Although the Redlisted bontebok is the least common antelope species in the southern African subregion, its potential pre-historical occurrence in the WCNP area cannot justify keeping this species in the park, since climatic change (and associated vegetation change) has taken place since this time, and it is therefore currently considered to be extralimital. Furthermore, there are some doubts as to the WCNP population’s genetic integrity, and this requires investigation.